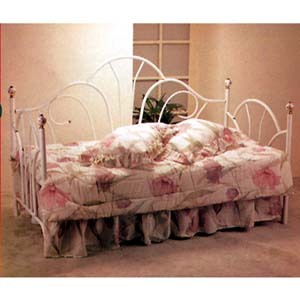 Peacock Style Day Bed With Porcelain Knobs. Available Black or White. Twin Size Mattress required not included in price. Please Note: If you want to use one Twin Mattress then you would only need to purchase the 76 In. Twin/Full Rails. If you want to use two Mattresses then you would need to purchase the 39 In. Link Spring and the Pop-Up Universal Link Spring Unit. Size: 79 In. (L) x 38 In. (W) x 39 In. (H).